When you travel with Parkers Superior Class, you travel with the absolute certainty that you're the most important person in the world to us. For the length of time that you're in our care; nothing matters except you. We offer a wide range of coaches to suit all occasions. Travelling to and from meetings, airports, conferences and venues can take up a large portion of your working day, and we understand that your time is precious. Relax and recharge your batteries, email important clients or make private conference calls; it's up to you. With our complimentary bottled water, daily newspaper and even a meal en route if required; Parkers Executive Coaches Superior & President Class is never just about the journey... it's always about the experience. 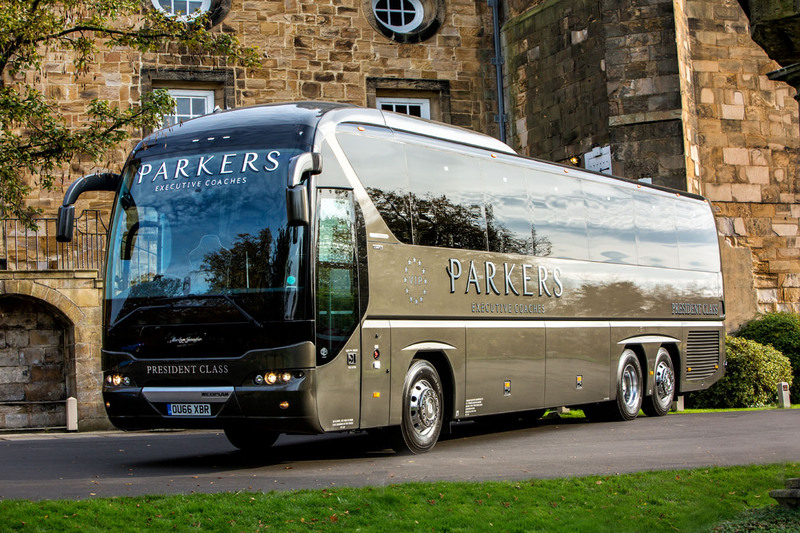 Parkers Executive Coaches Ltd currently holds a International licence. "We booked Parker's for a stag weekend we had planned, traveling from near Brighton up to Newcastle. I was a bit worried about how to get 19 people there and a plane was expensive with no main airport within 1hr radius and trains were awkward too because of changes and prices. I'm so glad we did. The coach was an executive one with very comfortable seats, toilet, fridge, microwave, usb ports, and music. The drivers were very well turned out and very nice people, who turned up early both ways and joined in the chat along the journey. Would highly recommend this company for comfort, customer service and reasonable prices." "The driver was excellent and very accommodating. However, we received a larger vehicle than had been ordered. This was less convenient for our needs and made access to some sites more difficult than necessary. In addition, the promised at-seat WiFi was not working." "Parkers provided an excellent service for our work Christmas night out taking us around Northumberland with various drop offs and pickups. The bus itself was fantastic, our driver (Peter) was friendly, professional and fast at getting us around and was very accommodating to our various requests." "The company were incredibly helpful in all aspects of the journey, and even changed some details last minute for me. The driver on both parts of our journey was very polite and kept us informed as we were travelling. The vehicle was a luxury coach and was very clean upon boarding on both legs of the journey. Would highly recommend!" "The journey was perfect. The driver was very smartly turned out and could not have been more helpful. The vehicle was very clean and comfortable." "On time, immaculate coach all in all excellent service and good value for money. Would totally recommend."